Imagine it is early March of 2015. You look out over your garden beds and notice the snow is beginning to melt. You sigh, realizing you still have a long and tortuous wait until the spring flowers begin to bloom. But WAIT! What is that purple flower bravely poking up it’s nose through the cold, wet soil. It’s an Iris reticulata flower! That is EXACTLY what happens to me every single year when I look out my study window in late winter. Thank God for the very early, diminutive bulbs. I cherish them so much. 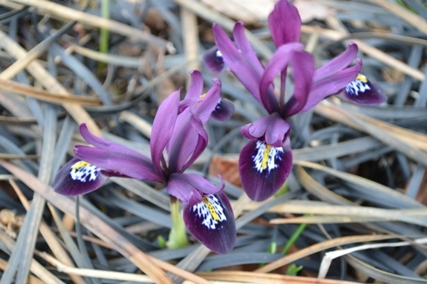 I have had Iris reticulata growing in my home gardens for the ten years I have been there. At Natureworks, the drifts, which are over 20 years old, are amazing and are the cause of much yelling, screaming, and rejoicing when we see them. Plant lots and LOTS of the earliest blooming bulbs. You will thank me next year!